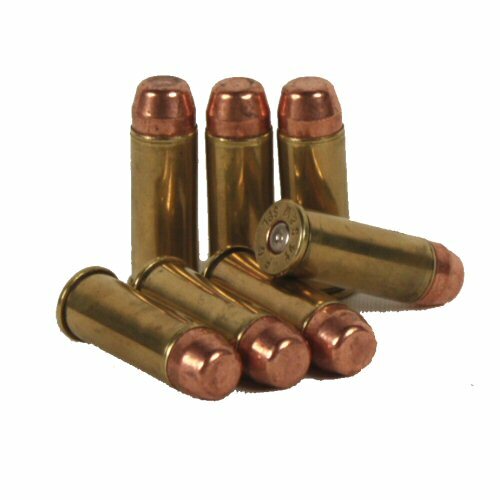 A single inert cartridge comprising of an fired case deactivated primer in .44 Special which has been refitted with a 240 grain FMJ TC head. The .44 Special superseded the .44 Russian as smokeless powder replaced black powder at the beginning of the 1900s. The .44 Special cartridge is longer than the .44 Russian. In the first decade of the 1900s, Colt began to make revolvers that were chambered for both .44 Russian and .44 Special. Due to similar performance characteristics, speculation grew that the extra length of the .44 Special cartridge was to force Smith and Wesson enthusiasts to purchase a new revolver because the cylinders of the popular New Model 1, 2 and 3 Smith and Wesson revolvers were not long enough for the new cartridge. .44 Special is shot today with revolvers now developed to take .44 Magnum and .44 Special. Heads are correctly fitted with a press and not hammered in place, so the round has a more authentic appearance over rounds where the heads have been inserted too deeply. Case necks have been crimped to hold the bullet head in place. Perfect for film, display, diorama or to add authenticity to a revolver or turn of the century display. Can also be worn as fashion accessory. Cases are brass. Please note that all rounds have no propellant or live primers. This is an inert .44 Smith and Wesson Special bullet. To restore a shiny finish, rub the cartridge with toothpaste or a commercial cleaner. Please note that price is for ONE round only. NB: All inert ammunition travelling OUTSIDE mainland UK must be shipped by international courier (eg TNT, DHL).